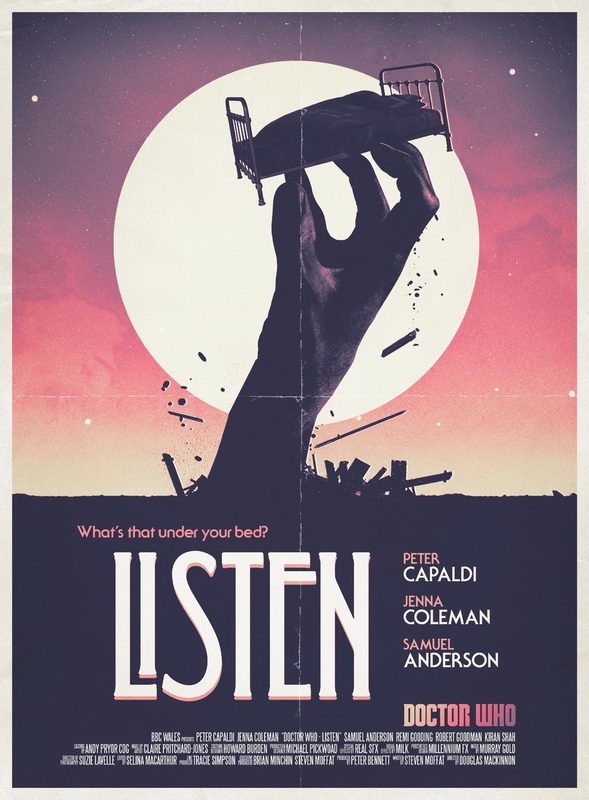 Written by Steven Moffat and directed by Douglas Mackinnon, Listen focuses on humankind’s fear of the dark and the unknown and what if there is something that really exists under the bed. Meanwhile Clara (Jenna Coleman) is on a disastrous date with the unpredictably moody and insecure Danny Pink (Samuel Anderson) until the Doctor rescues her and asks her to help him answer his question. He asks Clara to fly the Tardis using her childhood memories of those monsters she believed in as a child to guide her to that moment when she was a frightened kid. They land but not where they were supposed to for Clara had someone else on her mind moments before. There they meet a young boy called Rupert Pink and Clara suddenly realises that it is Danny and that it is he who is scared of monsters under his bed. Clara talks to the boy and tries to put his mind at rest. As they lay under the bed something sits on it and they both freeze. Clara gets out and confronts whoever it is on the bed to be confronted by a figure underneath a bed sheet but no idea who or what is under there. The young Danny rushes over to her as Clara tries to talk to what she thinks is a prank in bad taste. That’s when the Doctor appears behind her. He tells the kid to be afraid for fear is what makes us strong whilst Clara tells him not to be afraid for fear of always being scared. Together they stand trying not to look at it and then the Doctor tells them to turn away and not to. The thing moves from the bed and approaches them, standing right behind them, unmoving and with the cover still over its whole being. And then the cover falls off but you never see what is beneath it, just a brief shape of darkness before it leaves them all alone in the room and is gone. Clara comforts the boy again and tells the Doctor to keep quiet as he interupts. She plants the seed of him being a soldier into his head and is about to tell him a story to get him to sleep when the Doctor touches him on the forehead and wipes his memory of the night, sending him to sleep. Clara asks what he sis and why and he replies, ‘Dad skills,’ referring of course to him being a parent and grandparent. Clara asks the Doctor if she can correct her date from earlier and he obliges but when there it all goes wrong again but it’s here that she meets a man in a spacesuit who takes her to the Tardis. His name is Orson Pink and he is from 100 years in the future, the Doctor curious about the family since the boy they had met and Clara’s date as well. He has a toy that Clara gave the boy at the children’s home and Orson explains that it is a family heirloom given to him by his parents and grandparents before them. She suddenly realises that he could be her great grandson, but is it? They all travel to the end of the universe and a dead planet with no life on it. Is it the planet where the Master played by Derek Jacobi regained his memory and became dark again and then regenerated into John Simm‘s crazier incarnation? It doesn’t actually say but you get the feeling it is. The episode then turns into another previous story in which they are seemingly trapped and something is trying to get in. It plays on our fears of the mind and what we imagine to be real. Knocking on the door, a scrape against the window or a feeling of being watched when no-one is actually there and so on. Something does knock and tries to get in. Again they never quite see the monsters, just something at the corner of their eyes or on a blurry screen. Clara manages to fly the Tardis away from the attack, the Doctor out cold whereupon she lands them on a farmstead. She has no idea where they are and creeping through the barn to find out, she hears a small boy crying. She is about to alert him to her presence and comfort him when two adult voices are heard coming into the barn. Clara dives under the bed and stays perefly still listening to what the adults are saying to the boy. She thinks it’s Danny Pink but is shocked to realise it is in fact the Doctor as a boy and that she is on Gallifrey. The adults tell him to stop with the crying, saying he will never make a Timelord or get into the Academy the way he is and only stands a chance of ever making it as a soldier. He is told by the woman that he can go into the house whenever he likes, that he should join the other boys and that the door will be left open for him whilst the man is strict but seemingly wants the best for him. Where exactly was he? Was it his home and does he have siblings? Were the adults his parents or other people who looked after him as a child? It turns out that the Doctor has always been afraid of the dark and what may lie under the bed or in the shadows and it was Clara who gave him that fear. She realises this and corrects her mistake, telling his young self to never be afraid. She then goes back to the Tardis and tells the Doctor never to go out there and see what she has seen. 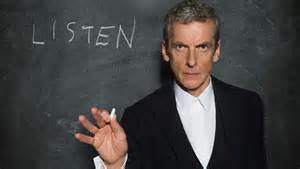 He is angry with her saying no-one tells him what to do but something stays him and he obeys Clara. John Hurt‘s incarnation makes a brief appearance in the episode when he went to an empty barn on Gallifrey in the 50th anniversary special. There are many links to much earlier episodes from the very first one until the last few seasons. It is a nod to the past Doctor’s and a very thought-out and well written script. It has everything in it and I can imagine kids were worried about going to bed that night. It reinstated Doctor Who as something to be scared of and yet something to watch again, far removed from the camp days. It was a prefect episode and is now one of my favourites of all time. Time Heist is the next episode and is written and directed by the same people from this episode along with Stephen Thompson as a joint writer. I can’t wait for it.